At the suggestion of a friend, I recently watched the movie Hush. Although I viewed this film on Netflix, there was no chill. 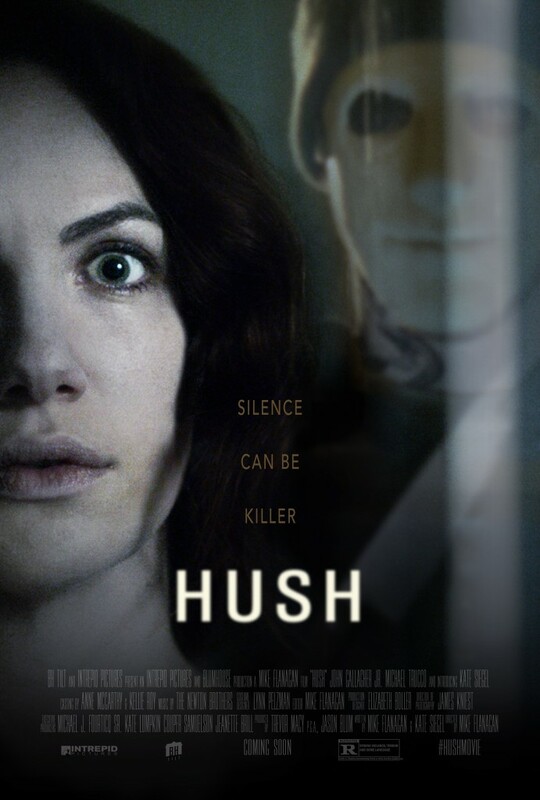 Hush is a horror film that revolves around deaf writer Maddie (Kate Siegel) who has retreated to in a cabin in the middle of nowhere to live a life of isolation, and to pound the keys for her new book. The solace she thought she would enjoy soon turns to terror as a masked psychopath shows up outside her house and begins to engage in psychological warfare. The killer (John Gallagher, Jr.), simply credited as “Man” somewhat disappointingly takes off his mask early on in the film, but when you watch it, you’ll understand why he does it. Armed with a crossbow, the killer lets Maddie know that he could come in to kill her any time he wanted, but chooses to terrorize her first. The fact that Maddie is deaf is an inventive twist, as she can’t hear what he’s doing outside, and quite often can’t see him either. Another interesting plot point is that Maddie, who wasn’t always deaf, hears the voice of one of the characters she created in her head, guiding her through all of the scenarios that wind up with her dead on the floor, as well as the one in which she lives. Seemingly outmatched, Maddie engages in a battle of wits with the killer, and it’s either the writer in her or extensive survivalist training that gets her through to the end. Hush is much like another one of my favorite horror movies, The Strangers, as it cuts out any supernatural nonsense and features no creepy, evil children. In that, the horror genre needs to buy some new material. I’ve said it time and time again, a horror movie that features a real life setting and a human killer who has no discernible motive is always refreshing. Funnily enough, it took watching the entire movie and then staring at John Gallagher Jr’s name for several minutes afterward to remember that he played awkward but lovable Jim Harper on HBO’s The Newsroom. Nice casting here. Hush is a taut and able thriller that accomplishes feelings of real-life terror for the viewer in less than 90 minutes. The action starts early and nothing drags in this concise and believable film. Highly recommended. Catch it on Netflix now. For what it sets out to do, it’s quite effective. Nice review. Indeed. A simple premise with a twist, and a movie that’s no longer than it has to be. I enjoyed it thoroughly. Thanks for reading and for the comment!